Smelling the wax, that description was right on the money. I could clearly smell red currant and sweet strawberries perfectly with strawberries standing out the most, and I was actually happy about that. I love currant, it’s so fresh (and strong) but it can also be overpowering when blended with other scents. Not with this one though. 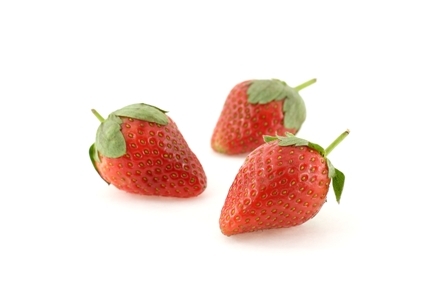 The sweet strawberries really shines through. Hoping that stays true once the candle is burning. I lit my First Crush candle in a small bathroom to start out and that’s where it stayed till the very end. It didn’t take long to reach a full melt pool and the aroma… a snap, cracking and blow torch sound followed by a sweet strawberry and currant fragrance. I put the sound effects first because that’s the first thing you notice before walking into the room. The sound from the candle can’t be missed. Once you walk into the room, the fragrance hits you head on and it was pretty awesome, although not very strong. The aroma… sweet strawberries first with a subtle punch of fresh currant in the background. I very much enjoyed this scent combination and would recommend it to all you strawberry lovers out there. Strength – I would rate First Crush a 6 out of 10 in a really small room. Yep, not super strong but perfect for a small room. Anything larger and the aroma would be lost. 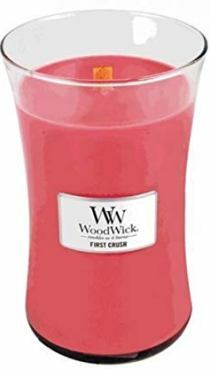 How did my First Crush candle burn? This candle burned perfect. Zero wick issues. The wick crackled and popped from beginning to end and it burned clean and even as well. A+. First Crush was quite enjoyable and I’m glad I tried it. I don’t burn strawberry fragrances often because they’re generally hard to get right. This candle smelled pretty authentic however and I think the added currant gave it that fresh pop it needed. Definitely give this candle a try if you’re in the mood for a sweet strawberry with an added twist. I love burning Wood Wick candles. Yes, they aren’t the strongest candles on the block but I don’t necessarily purchase them for scent alone anyway. Aesthetics plays a huge role and these candles give me that in abundance. If you haven’t tried one yet, I highly recommend.